A neat, attractive and lime-loving specimen of the Proteaceae family, this bushy shrub will be a delightful display in a fynbos garden. Leucospermum muirii is a perennial, bushy shrub growing up to 1.5 m tall. The plant grows from a single stem at the base with side branches bearing wedge-shaped to linear leaves. The leaves are a pale grey-green. Yellow flowers are made up of a single bud or borne in a group of up to four flowers. As the flowers mature, they turn orange. The flowering period for the Albertinia pincushion is from July to October. The plants bear nut-like seeds which are released 1 to 2 months after flowering. The bush has an average speed of growth and can live for many years under correct, well-drained conditions. 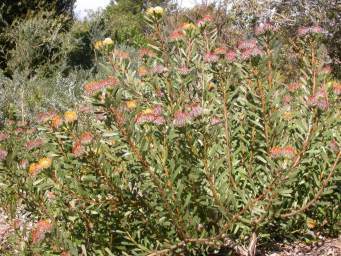 Leucospermum muirii is placed in the threatened category as endangered (EN). Its global status has been recorded as rare (R). The loss of habitat through coastal development and agriculture are the main causes for this status. 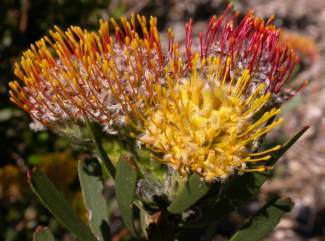 Leucospermum muirii is found in the Western Cape and is a limestone-loving species which grows along our eastern coast. It occurs on white tertiary sand of the Agulhas Plain floristic region at altitudes of 90-250 m. The plants are usually encountered in small but dense stands. 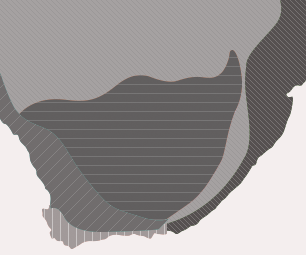 The distribution is rather limited from Albertinia to Melkhoutfontein and Still Bay. 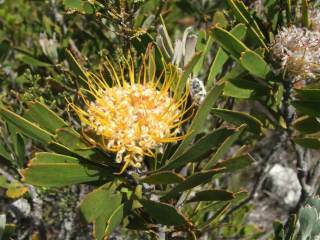 Proteaceae is one of the most prominent flowering plant families. There are about 1400 species in more than 60 genera in this family, which occur in southern hemisphere countries. Australia has the most with 45 genera, followed by Africa with 14 genera, where more than 330 species occur in the southwestern Cape alone. Other countries where they occur include Central and South America, islands east of New Guinea, New Caledonia, Madagascar, Southeast Asia, New Guinea and New Zealand. The family is an ancient one and existed in the time of the dinosaurs. The Proteaceae family consists of numerous genera such as Protea, Leucadendron, Leucospermum, Serruria and Paranomus to name a few. They vary from groundcover types to trees. This may be the reason behind its original naming by Carl Linnaeus, the father of taxonomy. Proteus was the mythological Greek god who could see the future and always spoke the truth, but in order to extract a prophecy, one had to grasp him tightly while he changed into numerous animate or inanimate forms. The flowers of this pincushion are pollinated by birds. Once the seeds are ripe, they are released immediately. Ants collect the seeds and store them underground in their nests. During a fire, the mother plants will die and then these stored seeds will germinate to replenish the population. Leucadendron muirii makes a wonderful garden specimen, especially in a fynbos garden. It can be used in a limestone coastal garden planting. Propagation can be done via cuttings or seed. Sow seed in May. Seed requires warm day and cold night temperatures to germinate. Prepare seed trays containing a well-drained mix of bark and fynbos soil (50:50 mix). Scatter seed on top and lightly cover with river sand. Water in well and use a fungicide treatment. Keep seed tray moist, not wet. Seed germination varies and will sometimes even only germinate the following year. As the first true leaves appear, transplant seedlings into pots in a well-drained, sandy fynbos mix. Grow on for a year before transplanting into the garden. Take tip cuttings from December to March. Use a rooting hormone and place in a well-drained mix of bark and polyurethane. Cuttings must be kept humid, but not wet. Rooting occurs in approximately five weeks. Harden off rooted cuttings for three weeks and then transplant into pots as for seedlings. In the garden Leucospermum muirii can be used as a filler shrub or specimen stand. With its average height it makes a good mid-layer planting. Used in conjunction with other fynbos species such as Restio, Buchu and Erica, it makes a lovely display. It can be used in rockeries and open bed plantings. A root pathogen, Phytophtera, is detrimental to Proteaceae. Symptoms include the plant looking wilted and dry followed by yellowing and death. As these symptoms are only seen once the fungus has damaged the plant, the best course of action is to remove the infected plant and burn it. Thereafter, sterilize the affected soil with a contact fungicide and refrain from replanting Proteaceae in that area. Good, general plant hygiene and healthy, vigorous mother stock will increase the potential of younger plants to remain healthy. Coombes, A.J. 1992. Guide to plant names. Reed International Books, London. Rebelo, T. 1995. Proteas. A field guide to the proteas of southern Africa, edn 2. Fernwood Press, Vlaeberg. Rousseau, F. 1970. The Proteaceae of southern Africa. Purnell, Cape Town.